A caravan offers an element of freedom and allows us to stay and explore hidden places across this great country of Australia. The convenience of hooking the caravan up to the back of your car, Ute or 4WD makes this opportunity to travel carefree even more appealing. However, there are times when you are unable to transfer your caravan, camper trailer or motorhome yourself and you need to find an experienced and dependable caravan transport company who is prepared to do that for you. Whether it’s a long trip that requires a caravan transport company with a truck and a multi-car carrier trailer or just an individual equipped to tow the caravan for you, you can find the right transporter for the job. Get Quotes to transport caravans today! Get 3 Quotes for transporting caravans. It’s free to request quotes. Caravan: If you just need to find someone to tow the caravan, then there are individuals and businesses who can perform that for you. Sometimes, however, you will need the caravan transported on a truck, especially for interstate purchases or if you need the caravan hauled long distances, and in this instance you will need to find a caravan transport company with a car carrier or a truck and trailer that is equipped to carry caravan freight. Pop Top Caravan: If you need a pop top caravan relocated anywhere across Australia, for example from Melbourne to Sydney or Sydney to Brisbane, or even from NSW to Victoria or SA to WA, then you can get caravan transport quotes directly from ABN verified caravan transporters operating throughout these areas and beyond. Camper - Slide On: If you need a slide on camper trailer shifted then there are some circumstances that can impact which carriers can provide you with caravan transport quotes. If you’re happy for someone with a Ute to carry it then there’s that option but if you need it moved on the back of a truck then you’ll need to find a caravan transport company with the right vehicle and equipment to do so. Camper Trailer: If you’ve made a recent purchase for a camper trailer interstate and need to have the camper trailer relocated to your home, you can find a reliable caravan transport company capable of transporting it. 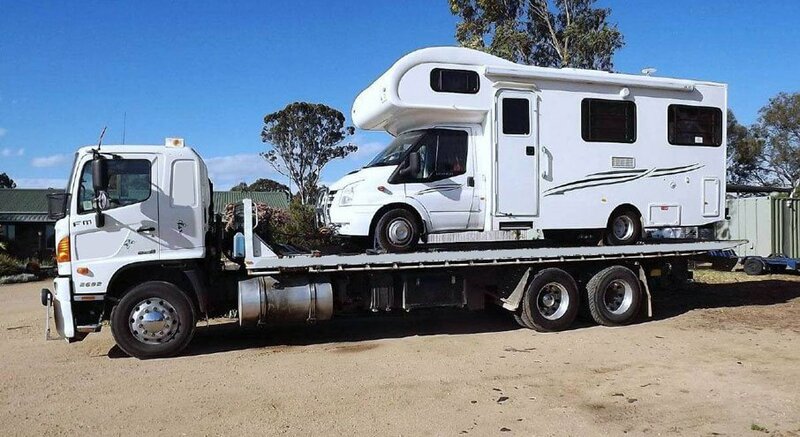 Perhaps you’re relocating to a new home and need an experienced caravan transporter to take the camper trailer to its new destination. You can find a dependable and experienced carrier to move the caravan freight for you. Pop Top Camper: If your pop top camper can’t be towed for whatever reason and you need caravan delivery, it can be winched onto the back of a tilt tray truck or can be loaded on a trailer equipped to carry caravan freight using loading ramps by a caravan transport company. Include your pickup and delivery locations to connect with caravan transporters. 5th Wheeler: A 5th wheeler offers a world of possibilities and it’s the great Australian dream to hook it up to the back of your Ute and go exploring this great country. However, there comes a time when you can’t tow the 5th wheeler yourself and you need to find a reliable caravan transport company capable of carrying that for you. You can find ABN verified and professional caravan transport companies to perform that for you. Pop Top Campervan: A pop top campervan can be transported on a car carrier, by a caravan transport company on the back of a tilt tray truck or trailer or by using loading ramps to get the pop top campervan onto the back of a flat top truck or trailer. You can connect with experienced caravan transporters for transport quotes and costs. Motorhome: For interstate trips, through regional areas, within metropolitan areas or from one capital city to another, you can find a dependable and experienced caravan transporters to take your motorhome to your pickup and delivery locations. Whether it’s SA to Victoria, Sydney to Melbourne or Darwin to Perth, there are truckies and caravan transport companies working through these areas who have the right vehicle and equipment to move your caravan freight. Whether you need a caravan moved interstate, a 5th Wheeler relocated from one capital city to another or a motorhome delivered from a purchase across the other side of the state, you can connect with ABN verified caravan transporters with FreightQuotes. Simply submit the details of your caravan, where you need it picked up and delivered to and what dates you need it moved. Enter this information into the FreightQuotes easy to use free online freight quote tool and this will be sent to the caravan transport companies operating in those areas with the right vehicles to carry that type of caravan freight. From there, three of these caravan transporters will contact you directly with your caravan transport quotes and costs. A simple, fast and free way to get freight quotes. Caravan transport is available Australia wide. This includes interstate, regional and metropolitan caravan freight covering all states and capital cities including Adelaide, Brisbane, Perth, Darwin, Melbourne, Canberra, Hobart and Sydney. Find transporters for cars, boats and motorbikes with FreightQuotes too. Get 3 Quotes for transporting caravan. It’s free to request quotes.